Here we are. October. And the Chicago Cubs are playing playoff baseball. Not only are they playing playoff baseball, but they're doing so against the St. Louis Cardinals and their elitist nation of self-proclaimed "best fans in baseball." Over the past several days, in my excitement over the Cubs' playoff berth, I've been referred to by a few St. Louis fans as a "bandwagon" Cubs fan. You're talking about the kid who pretended to be Ryne Sandberg and Jody Davis while his friends were Ozzie Smith and Willie McGee. You're talking about the kid who was bribed by his parents to stay for a full week of summer camp with the promise of a new Cubs shirt. You're talking about the adult who became physically sick to his stomach as he watched the infamous Bartman play unfold. I'm no bandwagon fan. I've just evolved into an adult with a job and a family who's content to follow his team in the papers when they're bad rather than maintaining baseball as the focal point of his daily existence. If you'd like, I'd be happy to tell you where you can park your bandwagon. So as we approach the first ever Cubs-Cards playoff series in the history of the game, tensions are high. The Cardinals are banged up and the Cubs have momentum. Still, this is somewhat foreign territory for the Cubs while the Cardinals are frequent playoff contenders. I've already declared that I expect relationships to be damaged as a result of this series. And I'm pretty much okay with that. I expect that by the end of this Cubs-Cards series, I will no longer be on speaking terms with at least a few friends and/or family members. I don't ask for much. And I know God doesn't negotiate. But today, I'm begging for one thing. 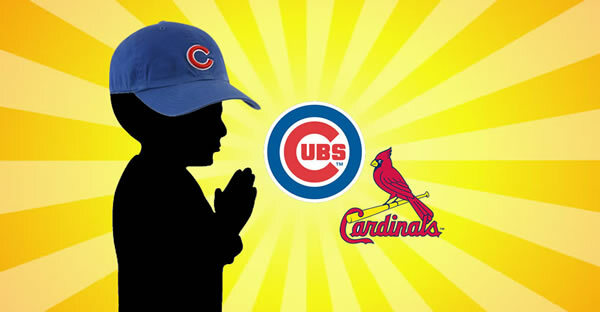 Please, God, let the Cubs beat the Cardinals in the NLDS. I'll donate generously to a charitable organization. I'll feed hungry stray animals. I'll say my prayers and exercise and take my vitamins every day. Please, just let the Cubs win. I'd be glad to endure five games of heart-stopping, gut-wrenching baseball. But for the sake of all that is good and holy -- Let. The. Cubs. Win.